If your lawn is pale green, yellow or even brown, but your neighbor's lawn is lush and dark green, you may scratch your head and wonder how two lawns so close together can look so vastly different. Grass needs three main things to achieve that dark green color--sunlight, water and nutrients. If just one of these vital things are missing, your lawn will suffer and lose that dark green color you desire. While it may seem like a lot of upkeep, once you get yourself on a schedule it is fairly simple to keep your lawn looking dark green. Cut down branches around your property to allow more sunlight to enter your yard. Sun-loving grass needs at least four hours of direct sunlight per day to thrive. Shade-tolerant grass needs a few hours of sun per day, with bright light the rest of the day. Follow an irrigation schedule. 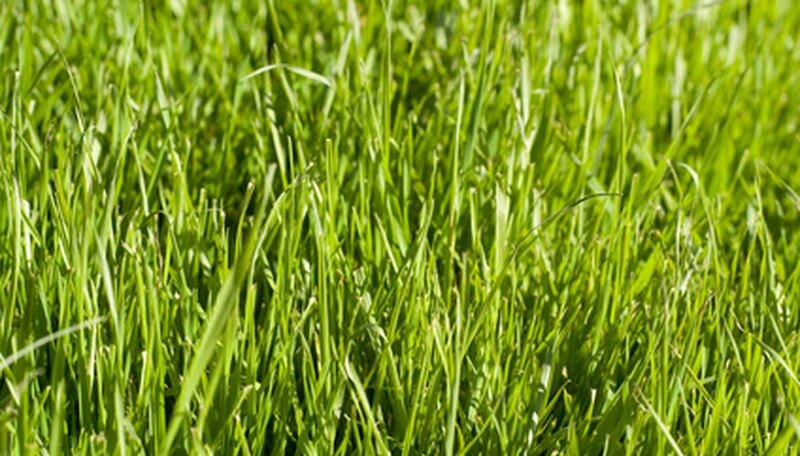 Grass needs at least 1 inch of water per week to remain thick and lush. This water should be applied all at one time to encourage grass roots to grow deeply. Fertilize your lawn using the correct amount at the right times. Apply a lawn fertilizer at a rate of 1 pound of nitrogen per 1,000 square feet in early May with your broadcast spreader. Apply the same amounts again in early June and early September. Apply a winterizer fertilizer in the fall after your grass has stopped growing. Apply it at a rate of 1 pound of nitrogen per 1,000 square feet with your spreader. Test the pH of your soil with a pH meter. Acid soil is a contributing factor to a declining lawn since grass thrives in neutral soil. Soil can become more acidic from pine needles accumulating on the ground and decomposing. If your soil is acidic, you can remedy it by applying 50 pounds of lime per 1,000 square feet with your spreader. Mow your grass at a height of 2 1/2 to 3 1/2 inches. Mowing grass shorter than this reduces the leaf area of the grass. This leads to reduced photosynthesis, which can cause your grass to lose its dark green color.